This is the latest offering from the Roll'd franchise. Roll'd founders, friends Bao Hoang, Tin Ly and Ray Esquieres, plus fourth partner Quintin Mansell, have transformed the space that once housed Ramen Ya in Melbourne's GPO, with bright primary colours, fluorescent lighting and raw timber tables in the long thin expanse between the GPO and Myer. The modern Vietnamese menu offers snacky dishes such as chicken ribs, a selection of pho, rice and noodle dishes, hot pots, and banh xeo, a crisp crepe with fillings like mushroom and tofu or lemongrass beef. 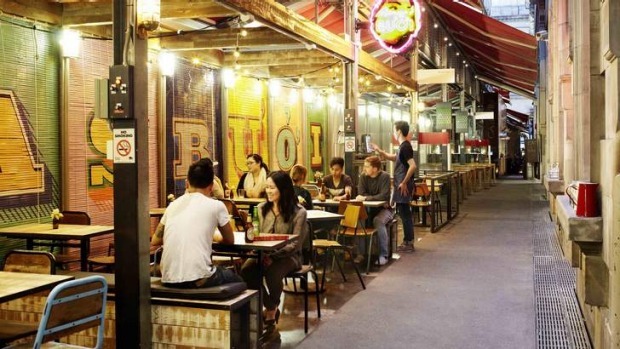 In keeping with their pattern of quick expansion (they already have 20 Roll'd outlets around Melbourne and interstate), the owners plan to open another two Mama's Buoi outlets this month, in Sydney's Surry Hills and Crows Nest. The Melbourne Mama's Buoi is open daily, 10am to 10pm, with a delivery menu also available.